We've added a twist to our very popular concealment vest that kick-started the industry. This vest can be worn either as a Level 3A bullet resistant concealment vest or as a regular concealment vest any day of the week; the ballistic panels are removable so you can choose to take out the protection. The BlueStone Safety Concealment Vest with Removable Ballistic Panel is made with Kevlar panels that overlap to allow for superior protection against many handgun threats in our world today. With the ballistic panels on, you have protection against handgun rounds up to a .44 magnum at point blank! 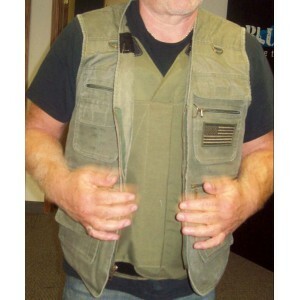 The vest also has concealment pockets, so you can comfortably carry Sub-Compact and Compact handguns any time. The concealment gun pockets work the same if the vest is worn with or without the removable Ballistic inserts. There is also a ballistc back plate that is fully removable as well. Keep protection within reach with BlueStone Safety Products!